Bride Craft Spotlight - DIY Brides! Are you, or do you know any DIY Brides? Love being in the spotlight? Have you used Bride Craft as inspiration to take the plunge to make your own DIY wedding items? Love what you’ve been seeing? Love what you’ve been creating? Then help inspire more folks to have the confidence to be a DIY Bride (…or bridesmaid, Groom, mother of the bride or groom, Great Aunt Ethel, etc, etc). 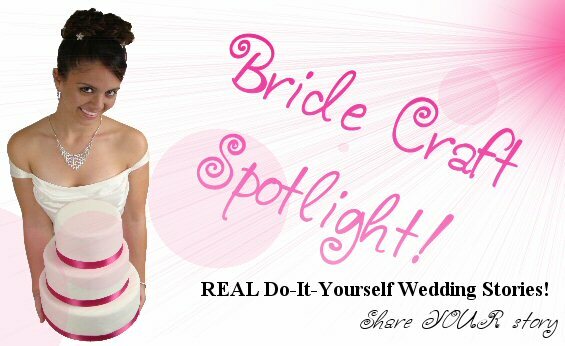 Let us feature you in our Bride Craft Spotlight! 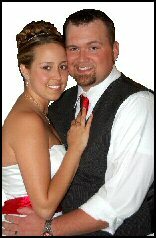 All you need to do is submit a couple pictures and answer a few brief questions about what it was like to make your DIY items, your wedding day, etc. And TA DA… Instant Bride Craft celebrity! Contact us today and tell your story. 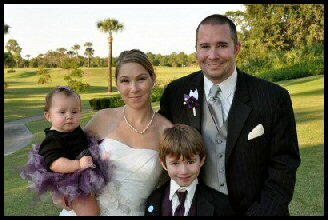 Becca & Will - Modern Bride featured "Nearly Vendorless Bride"
Something Old, something new, something borrowed, something blue... Check out this sweet way to add this whimsical tradition to your bridal bouquet! Wedding Cake Toppers CLICK and learn about today's most popular options for crowning your cake! Contact Us!Have a question? Want to suggest a project? Want to share your DIY Wedding Story? Need some advice? Just drop us a line through the contact form and get a response within 48 hours.